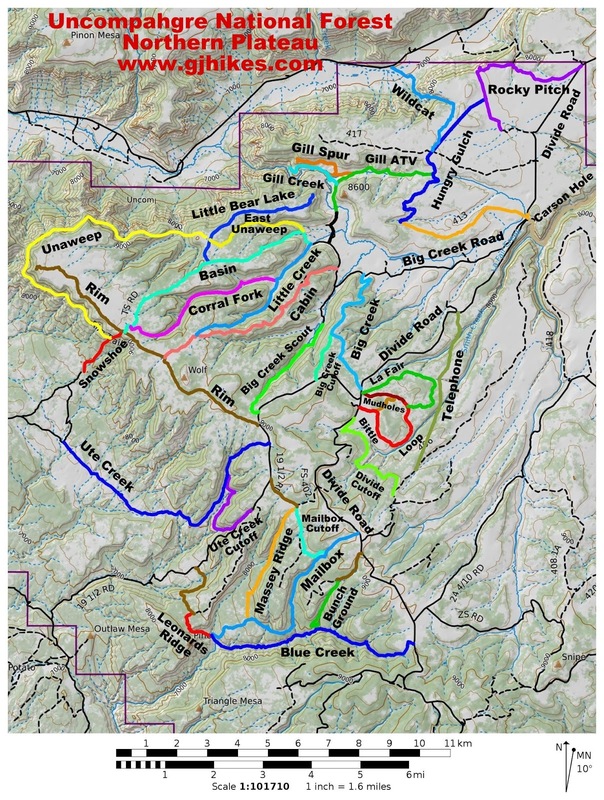 The Little Creek trail is located in the Uncompahgre National Forest about 35 miles south of Grand Junction. The trail is a pleasant hike along a creek through meadows, spruce, aspen and ponderosa pines. 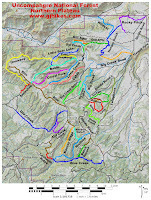 There are opportunities to form longer hikes by combing either the Corral Fork, Cabin or Basin trails to form loops. That's what some mountain bikers do to make for some pretty sweet rides. The directions to the Little Creek trailhead are pretty straight forward. Take Highway 141 towards Gateway to the Divide Road. Follow the Divide Road for 6 miles to the northern boundary of the Uncompahgre National Forest. Continue for about 3.5 miles on the Divide Road until you come to a fork in the road. Take the right fork and measure about 5.8 miles to the trailhead. You will pass the Big Creek Ranch about a mile before you get there. There is another trailhead sign at the same spot for the Basin trail which continues along the same road. There is parking for several vehicles beside the creek. The trail is very easy to follow except for a couple spots where it is being rerouted to higher ground to get around some seeps. There is no problem with knowing which way to go at these spots because the trail is obviously following the creek but it is a little confusing to know exactly where to walk to stay on the new trail. About one mile from the trailhead the Corral Gulch trail departs up a small canyon on the right. Shortly after the Corral Gulch fork the trail crosses the creek and continues up the canyon following a much smaller stream. Deer and elk can sometimes be spotted just inside of the tree line. It's hard to get a very good picture of them but you can still see them. If you are planning on filtering your drinking water the stream crystal clear stream gets smaller and smaller the further you hike. The last mile of the trail becomes completely dry. There is a steep section to climb after about 2 miles where the trail climbs to the upper area of the drainage. There was about a quarter mile stretch that had a lot of downed trees but there was a rumor floating about that a crew was coming in to clean up both the Little Creek trail and the Corral Gulch trail. The Little Creek trail ends at the Cabin trail after about 3.5 miles. You can take the Cabin trail to the right and make your way to the Basin trail and then either follow it back or take the Corral Gulch trail. Or you can do what I did and go back the way you came. The hike back out couldn't be much more pleasant. The trail is easy all the way back. The Little Creek trail is just remote enough that it doesn't get a lot of use. As you can see from the pictures the trail travels through very pleasant surroundings and is easy to hike. I gave it a moderate rating because of the one steep section and the overall length of the trail. For a nice hike along a stream and a good place to take your kids you could always turn around before the steep section. If you would like to see it for yourself then all you have to do is 'Take a hike'.